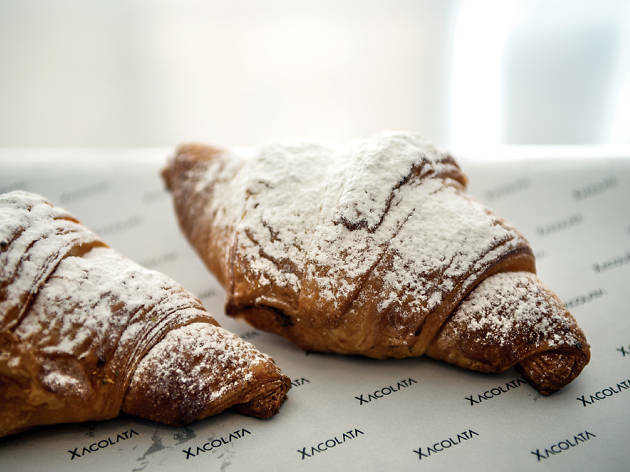 An admirable specimen of the croissant, a daily task for any master baker, can be found here in Xacolata. 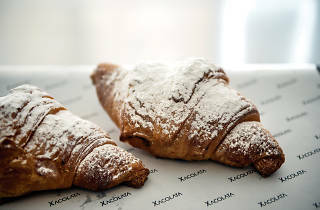 Jordi Sala has been decorated more than Patton (Torreblanca, Escribà, Mas Pau, El Bulli), and his bakery is where he makes some of the best high-end pastries in the neighbourhood. His croissants are heavenly, very crunchy, and the perfect balance of springy and savoury. He makes them so the pastry is flaky and crescent-shaped, which is a lot more difficult than just having an oblong result. And he uses butter. Lots of butter. 'If I were in Sarrià,' says Sala, 'I would sell them for a euro fifty, but I’m in Poblenou.' He also makes croissants filled with chocolate, Iberian ham and cheese, spicy Catalan 'sobrassada' sausage, tomato, mozzarella, and olives.